A new initiative aimed at luring cycle tourists to the Burren and promoting sustainable travel throughout the region has been announced. 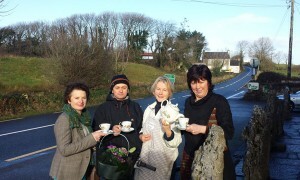 Developed by the Burren & Cliffs of Moher Geopark and An Taisce Green Schools Travel, in conjunction with the Burren Ecotourism Network, the ‘Free cup of tea if you cycle to me’ scheme will see cyclists offered a free cup of tea when cycling to participating businesses. This latest scheme is building on previous initiatives which saw the introduction of the Geopark sustainable travel App in 2013. The app provide details of all responsible transport options in the Geopark along with cycling times from service points to businesses. Storyteller Aindrias De Staic and singer Luka Bloom will launch the initiative with a ‘A free cup of tea if you cycle to me’ event at Poulnabrone Dolmen in the heart of the Burren on Tuesday, June 2nd. “This is one of a number of initiatives that the Geopark and the An Taisce Green-Schools Travel Education Officer, Róisín Garvey are working together to develop around the Sustainable Travel element of the Burren Specific Code of Practice,” explained Carol Gleeson, Project Manager, Burren and Cliffs of Moher Geopark. “Our aim is to raise the profile of the Burren and Geopark as a cycling destination. Burren Ecotourism Network members are already promoting cycling in the Geopark by offering similar discounts for persons arriving by bike or on foot but this initiative represents more of coordinated effort,” she added. The initiative coincides with the inclusion of the An Taisce Green Schools Travel and Burren & Cliffs of Moher Geopark Partnership in the longlist for the ‘Best innovation for carbon reduction’ category of the World Responsible Tourism Awards 2015. Founded and organised by responsibletravel.com, the awards scheme celebrates the most exciting and enduring examples of responsible tourism from around the world. Earlier this year, the Partnership also won the ‘Best Transport Initiative for Responsible Tourism’ category of the annual Irish Centre for Responsible Tourism Awards.